Made by Gibson, Marion in Hay, New South Wales, 1892. Double bed size quilt, hand pieced in crazy patchwork style from multicoloured irregularly shaped patches cut from plain and patterned silks, cottons and velvets, including damasks, brocades, tartans and stripes. The edges of these randomly shaped patches are embroidered with polychrome silks in a variety of decorative stitches. A red cotton binding has been applied to all four sides, forming a narrow edging on the front and a broader facing on the back. A wide ecru-coloured machine-made torchon lace flounce has been added all around. Wide grosgrain ribbon loops have been added to the upper edge at a later date to enable the quilt to be hung. This quilt was designed and made by Marion Gibson, Hay, New South Wales. At the time, crazy patchwork was very fashionable and heavily promoted in women's magazines. The style involved stitching together irregular shaped pieces of different materials to produce a vibrant mix of fabrics, textures and colours. Marion Gibson specifically chose this method to allow her to use scraps and pieces from friends 'far and near'. She called it her 'Friendship Quilt'. Heather Garland 21/1/2013 - My great grandmother used blanket stitch between the patches on her early quilts and only later feather stitch as seen in this quilt. The quilt was made by Marion Gibson and passed to her eldest grand-daughter. It has since been treasured by successive generations of women in the Gibson family. 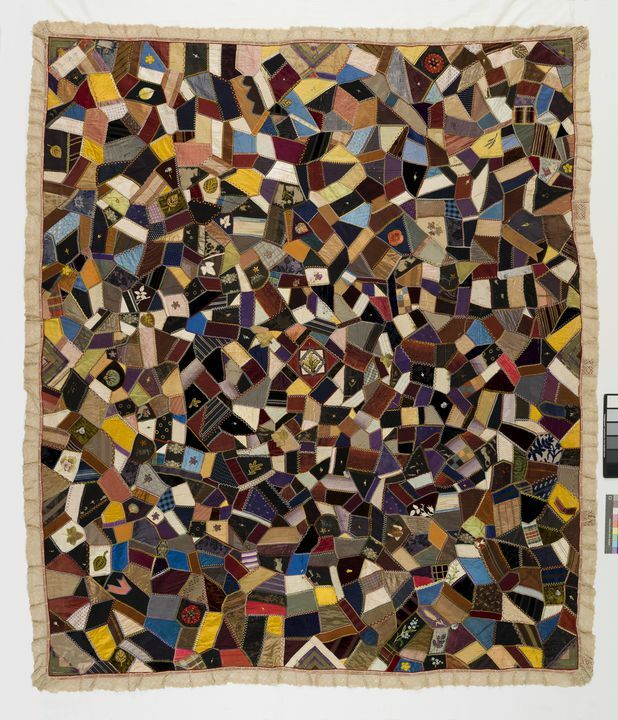 The quilt was about to be sold at an auction overseas when the family got together and raised $10,000 to purchase it. Overseas it would have fetched a higher price than in Australia. A book was written about the Gibson family - to be located. The Hay Museum has many objects relating to the Gibson family history.